The next morning we walked through the winding streets of Angers to the Chateau, an enormous fortress sitting precipitously on an outcrop of rock, its vast proportions dominating the edge of the city and overlooking the river Maine. Its history dates from the Neolithic period and it has been, in turn, over the centuries, a barracks, a prison and a castle that entertained a dazzling court life. 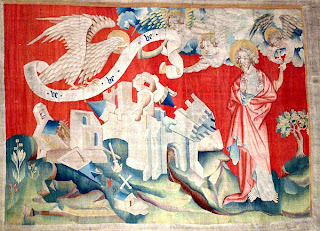 The Apocalypse tapestry measuring 100 metres long by 4.5 metres high was commissioned in 1375 by Louis 1, Duke of Anjou, and was completed in 1382, a scant seven years in the production of a masterpiece. Woven during the 100 years' war between Britain and France it depicts the hellish ravages of plague and famine in exquisite tableaux, the subject matter tamed in its representation by the order of its design and excellence of weaving. 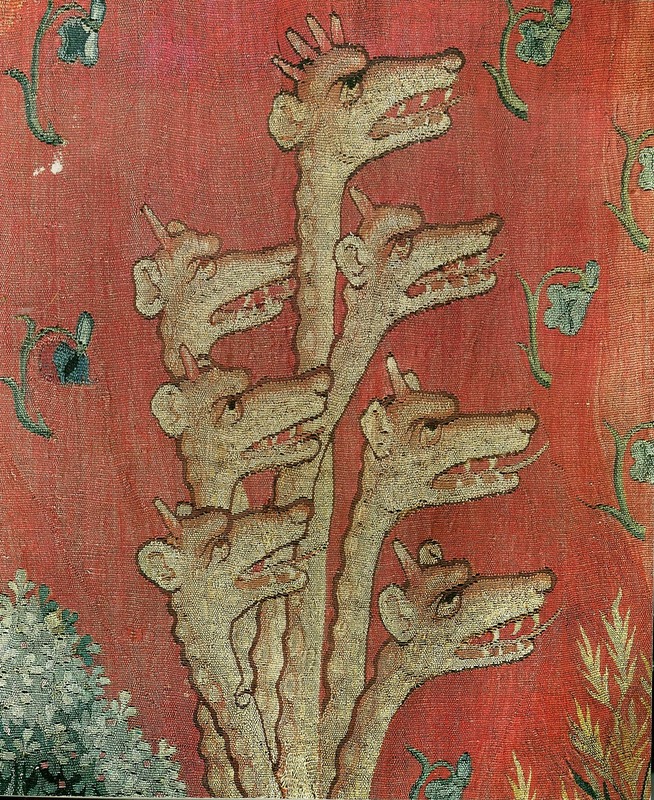 Designed by court painter Jean Bandol (also referred to as Jean de Bruges) from existing Anglo - French manuscript cycles owned by Charles V, 71 scenes from 7 panels measuring 80 feet long by 20 feet high have survived the centuries. 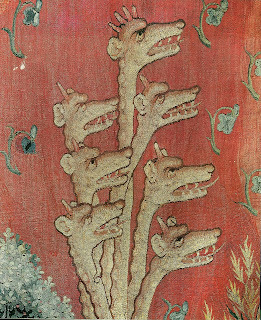 The tapestries, that had performed an important ceremonial role in the Royal courts between the fourteenth and seventeenth centuries, fell into disrepair, neglected and abandoned from the end of the eighteenth to the middle of the nineteenth until discovered and restored by the Canon of Angers cathedral. In 1954 they were returned to the Chateau to be put on display. Now exhibited in a purpose built, low lit gallery it is possible for the viewer to focus entirely on the detail of its superb rendering and lose oneself in the wonderful breadth of its scale. The suite is based on the Apocalypse according to St. John, who wrote the book of Revelations whilst exiled on the Greek island of Patmos in 96 AD, suffering persecution under the Roman Empire. It pictures a "divine" vision that is also a "prophecy", a work intended to 'edify, exhort and console.' Like many tapestries of the middle ages it plays an instructive and didactic role, illustrating the required constancy of God's faithful servants in the battle between good and evil. Here Christ is depicted as the Glorious Lamb, and Satan as the Great Dragon. St. John appears in each scene playing in turn the parts of witness, spectator and participant, his face becoming the emotional register for the unfolding events. It comprises 67 horizontal scenes, 1.8 m. in height and 2.8 in width, arranged in two rows and grouped in six large sections. Four of them begin with tall, vertical panels, 4.53 m. in width. It is known that Bandol made the cartoons for the first two sections and the start of the third. Interestingly, these initial panels have plain backgrounds, but from the third section they become ornamented with complex motifs of plants, birds, monograms and "quadrilobe lozenges", perhaps testament to the increasingly demonstrable skills of the weavers. The original strong background colours that alternate red and blue have faded to soft rose and teal but in 1982 the linings were removed to clean the tapestries and another "revelation" took place. It was discovered that the strong yellows had disappeared, the abundant greens had faded to soft blues and the oranges had turned pink. The tapestries were photographed and the images reversed for Front & Back, (Francis Muel, 1996) an excellent picture publication from which I have gleaned much of the information presented here. Photographed from the back, The Fourth Trumpet, the Eagle of Woe. There is much to see in the grounds of the Chateau, the walls of which are flanked by seventeen towers. Expansive gardens, a frescoed chapel that dates from 1410, the royal palace and a parapet walk all add to the atmosphere of this vast, enclosed space that takes you so effortlessly back in time. We found a charming creperie just outside the walls of the chateau to lunch in, appropriately named Creperie du Chateau, with a fixed price main course and dessert crepe served in a cosy atmosphere. The day was quite chilly so we were glad of open fireplaces and warm drinks. After a lovely lunch we strolled through a network of tiny, cobbled Mediaeval streets that looked as though they had been unchanged for centuries, delighting in the Tudor style facades and the rough, stone exteriors of the ancient buildings. We crossed the Pont de Verdun and walked the length of the river under an avenue of birches to St. John's Hospital, a collection of 12th C. buildings that displays the work of modern tapestry artist, Jean Lurcat. The hospital was founded in 1175 by the laity of Angers and later taken over by the clergy. It functioned for 800 years, looking after the needs of the poor and the sick, the great ward housing up to 360 beds. At the front of this remarkable space the original apothecary's dispensary is still on view, displaying a large array of china and porcelain from the renowned French manufactories of the 17th and 18th centuries. The hospital became the city's Antiquities museum in 1865 and remained so until 1967 when Lurcat's Le Chant du Monde found a home there. 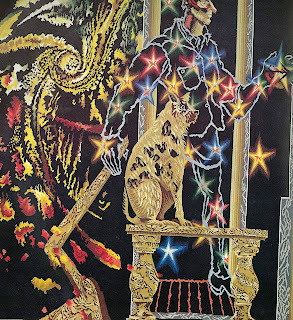 Acquired from Lurcat's wife after his death in 1966, their placement fulfilled his wish that it be exhibited close to The Apocalypse suite that had inspired him when he viewed it for the first time in 1937. The L'Hopital is set in delightful gardens and the exhibition space opens to a cloister, complete with well. Restored in 1988, it comprises a collection of buildings that also includes a sick ward, a chapel, storerooms and cellars. In the nave, the pointed Gothic arches soar upwards supported by delicate columns, providing the perfect volume for Lurcat's magnificent Song of the World (1956 - 1966) series of tapestries inspired by The Apocalypse. To see these suites in such close proximity (both physically and intellectually) to each other is a rare privilege. The French workshop practice of Jean Lurcat saw the restoration of the woven mark in its own right, reversing the trend of copying paintings in wool that had started with the Raphael cartoons in 1510. Drawing on Mediaeval precedents, his designs were tailored to acknowledge the skills and techniques of the weaver. A designer and painter, he became interested in tapestry in the late 1950s and re-invigorated the weaving community at Aubusson in central France by supplying designs to the individual ateliers. He created his mural form by exploiting the texture of the yarn and limiting the colour palette to forty five tones on a flat field, devoid of perspective. Interestingly, even in his recognition of the weaver’s art and his identification of the woven form as separate from a painted work, Lurcat issued detailed instructions to his weavers, especially in terms of dictating colour choices. He produced scaled up cartoons in gouache that were carefully numbered to indicate well defined colour areas. The ten tapestries of The Song of the World are incredibly vigorous, colourful renditions of a modern apocalyptic time, complete with atom bomb and its social fallout. The work is described by the museum as - "a manifesto of a committed artist, this set of ten tapestries is an epic vision, poetic, symbolic and humanist of the 20th century." Two distinct themes emerge - threat, destruction and chaos in the first four tapestries named The Great Threat, The Man of Hiroshima, The Mass Grave and The End of Everything. Then renewal, hope and joy in the next six entitled Man in Glory at Peace, Water and Fire, Champagne, The Conquest of Space, Poetry and Ornamentos Sagrados. Lurcat died while the final tapestry was being woven. 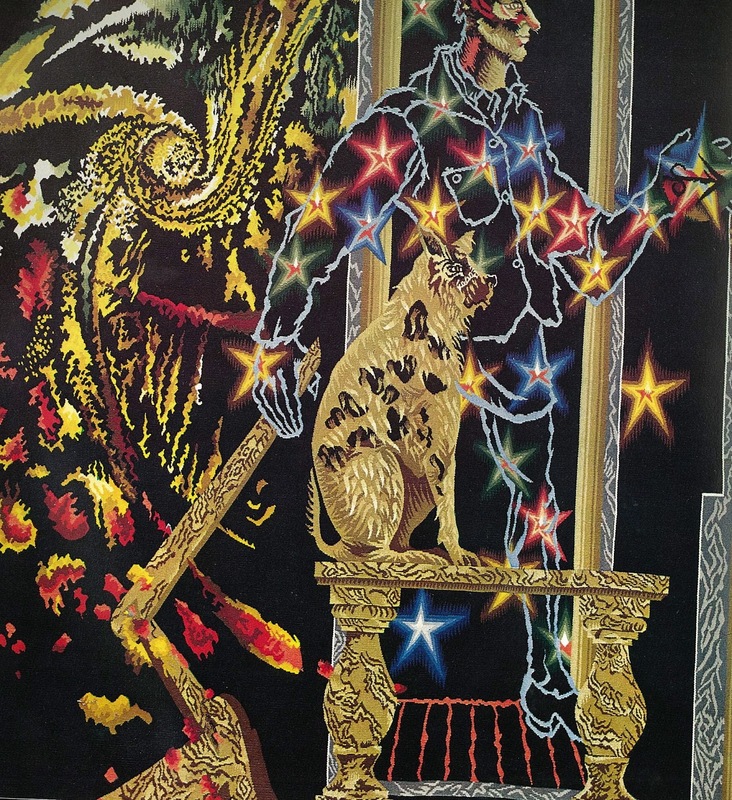 The tapestry Biennales in Lausanne initiated by Lurcat in 1962 unleashed the work of many International individual tapestry and textile artists over the next few decades and gave rise to the contemporary movement. Honouring his contribution the Musee Jean Lurcat was set up in the grounds of the L'Hopital, in a building that was a former orphanage, to show contemporary textile art. On this visit the special exhibition was entitled Sacre Blanc, a tribute to Thomas Gleb, a painter, originally from Poland whose name became synonymous with the New Tapestry movement. He pioneered huge, ropy "white on white" wallhangings in the 60s and 70s, all too familiar manifestations of crude, geometric, textured wall pieces that fashionably swept the textile art world at the time. However, in this exhibition, fifty invited contemporary textile artists had made work in response to the theme of the "colour white and the sacred" through the use of embroidery, ceramics, lace, drawing, photography, painting and weaving in a varied and subtle exploration of the theme that was an extension rather than a commemoration of Gleb's work.